On this project, we collaborate with Qest and Auto Průhonice to bring their garage service to a new level. Let’s dive in to explore how we tackled this problem. 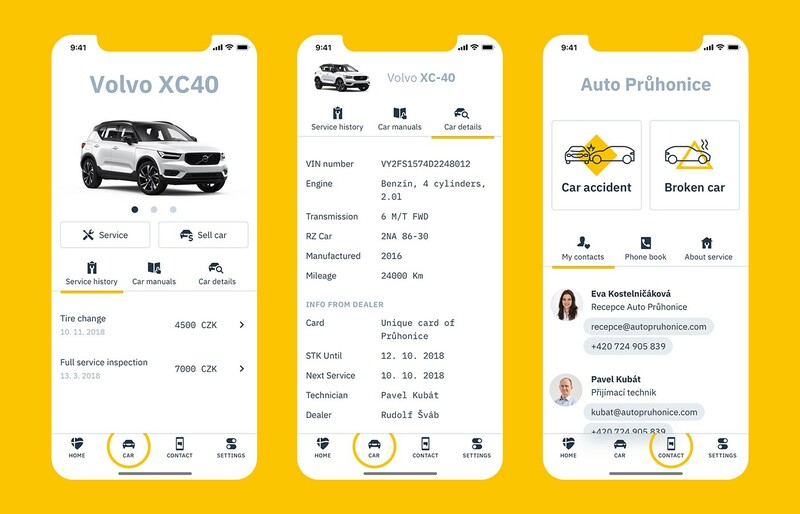 Considering the situation of Auto Průhonice (AP) and the vision of Volvo — helping drivers to control their cars via phone - we had to come up with reasons why people should download another app. Is there any potential added value that a new app can deliver to AP customers? What problems do people face servicing their cars? Are people interested in knowing the value of their cars? How can we leverage transparency of the garage service, which is already offered by AP? We uncovered the risky areas of the car owner care. 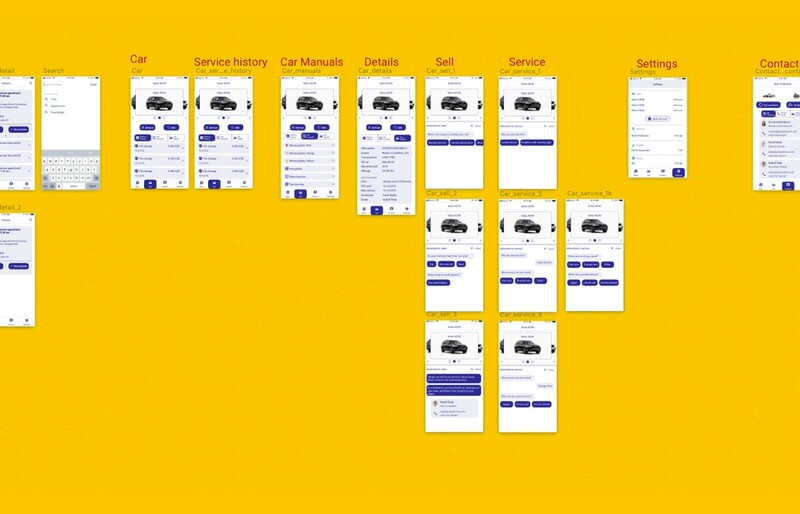 There is an overlap between what service AP wants to provide to its customers, and what part of the car ownership experience is protected by the car manufacturer. The conversational version turned out to be more successful — the interviewees got more engaged, they remembered better how they responded, and they felt in control of the process. We decided on the conversational version. After delivering the UX we went on to the UI 👩‍🎨. In the latter, we had less freedom of operation, which is typical. Our suggestions were less radical. 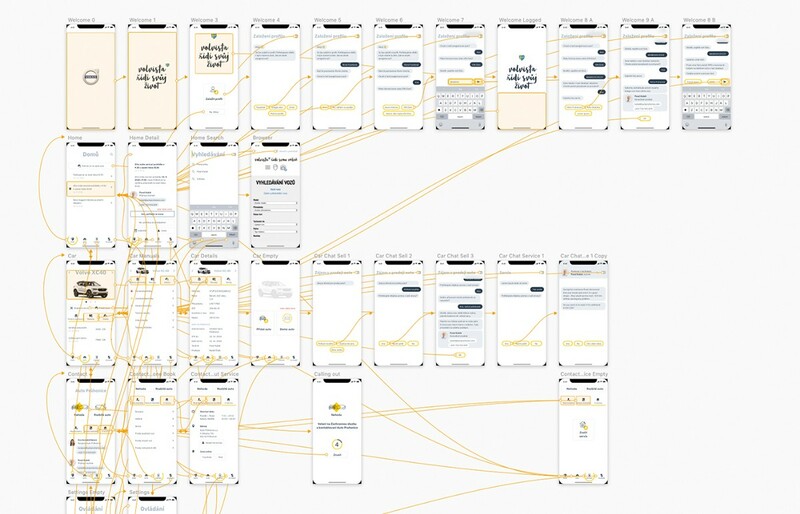 It turned out that it was ineffective to send our design drafts to the stakeholders only without showing the journey to the final version — e.g., the dead ends, different color variations. A lot can get lost in translation. 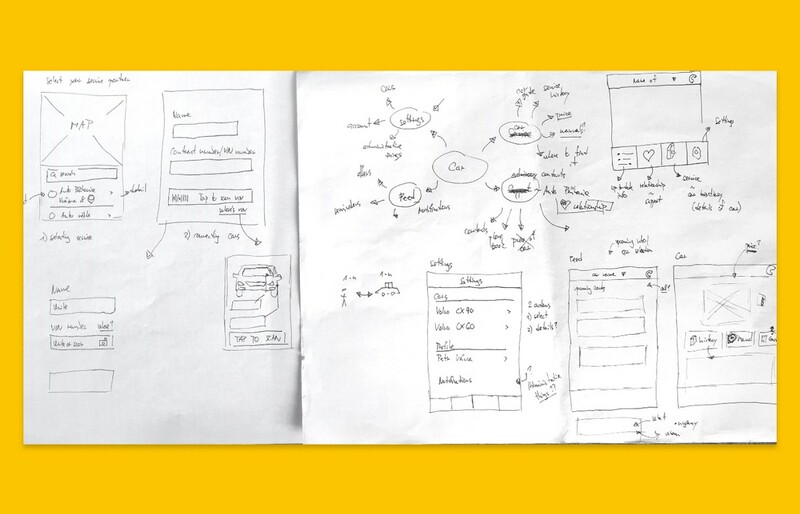 It’s easy to form an opinion on a visual design. Everyone does it. Sadly, the context gets often forgotten, and the feedback in terms of I like/I dislike is too crude to support a constructive discussion. 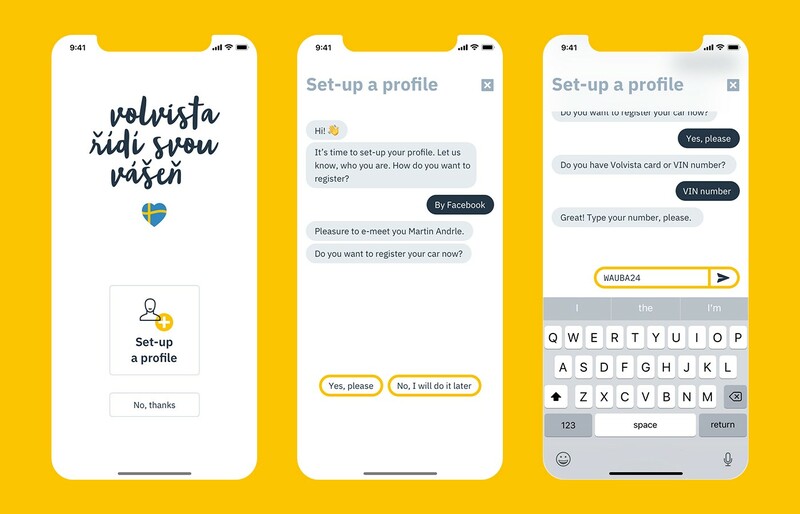 We decided to come with minimalist line design supported by brand yellow color, that would allow us to work consistently both on iOS and Android platform. But even this level of clarity needs to be changed based on context. So for our button “accident”, we went with a big filled diamond to get maximum attention. (Of course, in the ideal world, our button would not be needed, as an accelerometer in phone or internal system of Volvo car would detect accident automatically and start dialing process). 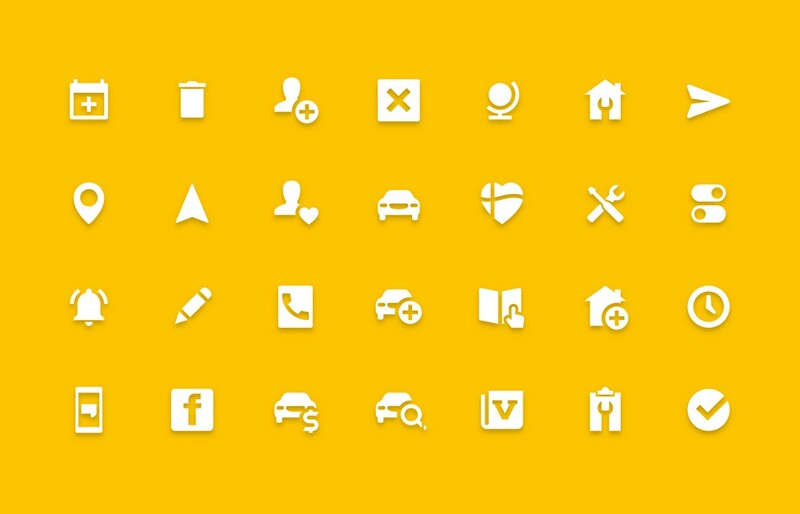 We drew our icons in two sizes and played with the weight of lines in the user interface. Most of our design is built on common industry practices and patterns. Good design is hidden — all negative spaces, margins, and micro-interactions have their place in delivering a smooth experience. In the end, we delivered 62 screens in two language modes with one design for both the Android and iOS platforms. We used conversational elements in the onboarding parts, i.e. 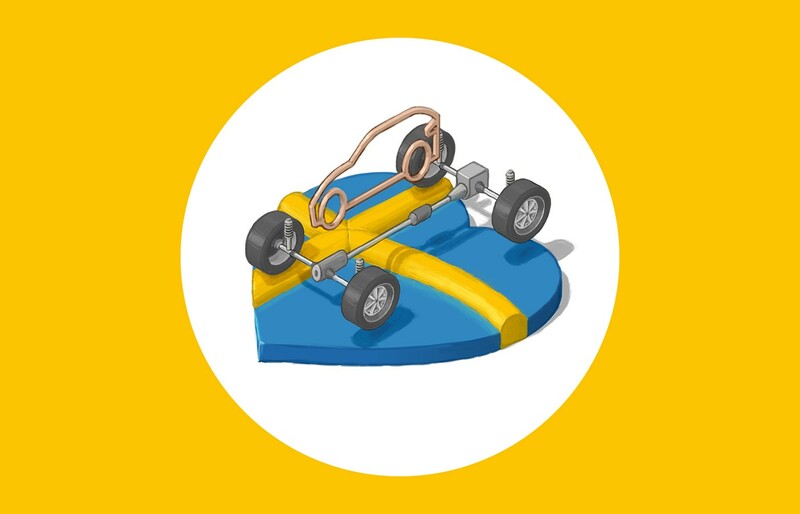 adding the car or the garage, creating a new user profile, requesting the car value estimate, or booking the garage maintenance. Our project was full of compromises, and therefore it is rated MVP for now. We may take it up again and elaborate if it goes down well with customers. Be careful about using hyped trends such as the conversational elements because you can easily end up in jumping from trend to another without seeing the whole picture. No need to mention the facility costs. We started to use the loom for presenting our designs to avoid potential misunderstandings, but more importantly, to explain the whole process because there are a lot of dead ends, and most of the time the stakeholders ask for it anyway. When we start arguing about details we are able to spend hours. We are losing the big picture and we are inefficient. I believe it is a sign of our perfectionism and an ability to deliver great products. I learned on the project that it was fine to test the apps of competitors to verify some of your assumptions when you are working on the budget to prepare your own. You have to explain to your stakeholders in advance that you're testing the competitors' apps instead of their own 🐣. Progress in the automotive industry is very inspiring for the designers, and we are looking forward to seeing how the car interior will be adjusted to the fact that we won’t have to sit behind the steering wheel anymore. It will be interesting to see the evolution of the car into a private assistant, who can take care of your schedule, and generally help you with your daily routine. And how are you planning to interact with your assistant? Probably by voice? If so, we are thrilled to talk about the progress in this field. We are happy to share what we have learned on our design adventures.